Base for securing to the roof. Use: the exhaust asial towers are suitable for the suctin of vitiated air flue gases and vapour from the environment.They are very useful during the summer season in those environments where air changes are necessary in order to keep the room ventilated. They are also used for the aeration of workshops, founderies, cement factories, tanneries, joineries, and for chemical mechanical and metallurgical industries where big air volumes have to be sucked at low pressure. Minimum working temperature - 20 °C, maximum + 80 °C (+ 150°C with cooling fan !!). The group is formed by a hight capacity centrifugal fan wheel ,which is statically and dynamically balanced .The centrifugal fan wheel is osperated by an electric motor of form B5-V1 and supported by a strong accident prevention galvanized net . 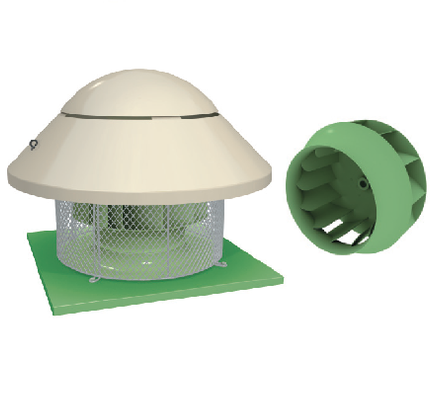 It is installed on the building roof by placing it on its square basament and it is protected from the atmospheric agents by means of a fiber glass hood. ErP: these fans are not subject to ErP because they are considered as exhaust towers.